12W AC Wall Adapter. Cable,for iPhone 5/5C/SE/6/6S/6 6S Plus/7/7 Plus 8 /8 Plus X ,iPad mini,iPad Air etc. iPhone Models. · iPhone 5. iPad Models. · iPhone 5c. · iPhone 6 Plus. · iPhone 5s. Cable Length : 2M 6FT. For iPod, iPhone 2G 3G 3GS, iPhone 4, iPod Touch 2nd 3rd 4th Generation iPod Nano 4th 5th 6th Gen All iPhone, iPad 1/2/3 Models Compatible. 2-In-1 features : sync & Charging. Includes: 2 Apple Sync Cords per order. You will always have a cord! Item weighs 4 oz. As Is :Tool is used condition, may or may not function. Like New :"Unused" Tool has never been used, may or may not have paper work or box. 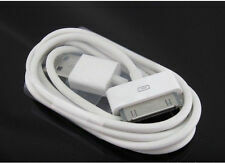 USB Cable is suitable for iPhone 3 3G 3GS 4 4S. USB Length:10FT. Style:USB cable. 1 x USB Cable(Other any accessories are not included). Use with both PC and Apple systems. Complies with fully rated cable specification using braid-and-foil shield protection. Includes: 1 Apple Sync Cord per order. Item weighs 4 ounces. Like New :"Unused" Tool has never been used, may or may not have paper work or box. May have a mark or two, but not from use. As Is :Tool is used condition, may or may not function. 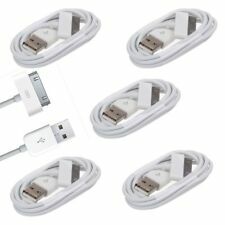 USB Cable is suitable for iPhone 3 3G 3GS 4 4S. USB Length:10FT. Style:USB cable. 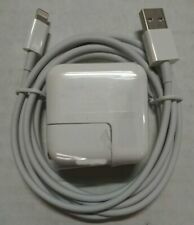 1 x USB Cable(Other any accessories are not included). Complies with fully rated cable specification using braid-and-foil shield protection. USB synchronize Cable. 1 x Cable for iPod Touch iPhone. Compatibility: All iPod with dock connector. USB2.0 high speed. Color: White. WIDE PRODUCT LINE. At dxpro-us, superiority in details and quality is a high priority. USB Cable is suitable for iPhone 3 3G 3GS 4 4S. Style:USB cable. 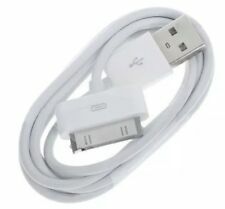 Package included:1 x USB Cable(Other any accessories are not included) USB Length:10FT. Complies with fully rated cable specification using braid-and-foil shield protection. IPod Nano 1st Gen. 1GB / 2GB / 4GB. iPod Nano 2nd Gen. 2GB / 4GB / 8GB. iPod Nano 3rd Gen. 4GB / 8GB. iPod Nano 4th Gen. 16GB / 8GB. iPod Nano 5th Gen. 16GB / 8GB. iPod 3rd Gen. 10GB / 15GB / 20GB / 30GB / 40GB. For iPhone 3G/3GS/4/4S/ iPad iPod Touch. Works with Apple USB Power Adapter for charging from a wall outlet. USB 2.0 for efficient syncing and charging. Connectors: USB Type A Male to Apple 30-pin. Cable color: White. Length: 3M (~10ft). You can connect your apple device and sync your phone and compatible PC with this 3M extension USB cable. iPhone 3GS 16GB, 32GB. This USB 2.0 cable connects your iPad/iPhone/iPod — directly or through a Dock — to your computer's USB port for efficient syncing and charging or to the Apple USB Power Adapter for convenient charging from a wall outlet. Used cable. Tested and working. Apple brand. Sync Cable. Apple iPhone 3G 3G/S 8GB \ 16GB, Apple iPhone 4GB \ 8GB \ 16GB, iPod 3G, 4G, 5G, Nano Compatible Data Cable. Trending at $1.48eBay determines this price through a machine learned model of the product's sale prices within the last 90 days. FEATURES: High Quality Extra Long 6 Feet AC Cord for Laptop adapters (AC Wall Cord Only / AC Adapter part is not included). CE/FCC/RoHS certified. COMPATIBILITY : This product has been tested and validated to ensure it will work with Apple Power Adapters. This USB 2.0 sync data cable can connect your iPhone or iPod directly or through a dock to your computer's USB port for efficient syncing and charging or to the Apple USB power adapter (not included) for convenient charging from a wall outlet. Sync your iPhone / iPod with the computer PC / Laptop. Cable Type: Charging and Data Sync Cable. Data Transfer Cable for iPod / iPhone with 30 Pin Connector. iPod Touch 1 2 3 4 1ST 2ND 3RD 4TH. USB 2.0 for faster transfers Connect with your PC/Laptop by USB port. Trending at $5.69eBay determines this price through a machine learned model of the product's sale prices within the last 90 days. Connect your ipod or iphone to car audio or amplified speaker with aux input. Compatibility: iPod, iPhone 2G/3G/3GS/4G/4S ipad 2 3 4. The dock connector sends line level audio out from your ipod, iphone, provides a better sound quality then the headphone jack output. Cable Type: Charging and Data Sync Cable. Sync your iPhone/iPod with the computer PC/Laptop. Data Transfer Cable for iPod / iPhone with 30 Pin Connector. For iPod 4th Gen (U2 Special Edition). For iPod 3rd Gen. I Pod Touch 1st, 2nd, 3rd, & 4th Generation. iPad 1st, 2nd, & 3rd Generation. iPod Nano 1st, 2nd, 3rd, 4th, 5th, & 6th Generation. iPod Classic (2009 and earlier). iPod 5th Generation. 12W AC Wall Adapter. Cable,for iPhone 5/5C/SE/6/6S/6 6S Plus/7/7 Plus,iPad mini,iPad Air etc. IPad 2G 3G. iPhone 2G, 3G 3GS, 8GB 16GB, 3GS 16GB 32GB. iPhone 4 4G 4S. iPod, iPod Mini, iPod Classic, iPod Nano I II III IV V, iPod Touch. An excellent cable for both Iphones and Ipods that use 30 pin cables. The item shown in the pictures is the exact model you will receive. This product is new, never used. 4S iPod nano up to 6th generation iPad, iPad 2. Compatible with iPod, touch up to 4th generation iPhone 3GS4. Cable Type: Charging and Data Sync Cable. Sync your iPhone/iPod with the computer PC/Laptop. Data Transfer Cable for iPod / iPhone with 30 Pin Connector. USB 2.0 for faster transfer Connect with your PC/Laptop by USB port. IPad 1,2,3. iPad mini 1. iPod touch 1st,2nd 3rd generation. LOC 3 Gently used charging cables from my prior IPhone & IPad One of them is an original Apple charger; the other is not and was used in my Jeep. You’ll notice black electrical tape around the one end (see pic); it got pinched under my seat. I fixed it and it works. Smoke free home! 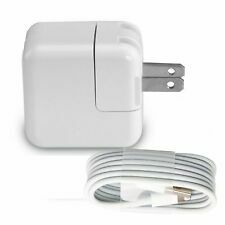 Works with Apple USB Power Adapter for charging from a wall outlet. USB 2.0 for efficient syncing and charging. Cable color: White. Cable length: 3Ft (approx. Quantity: 1x Cable. ). 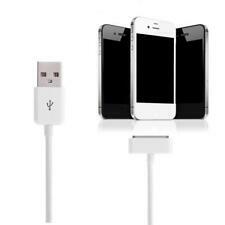 You're buying: 3Ft White USB Data Sync Charger Cable For iPhone 3G/3GS/4/4S iPad iPod Touch. 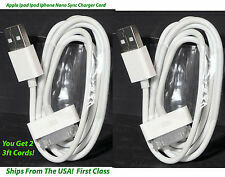 Brand new USB 2.0 high speed data & charger cable for Apple iPhone,iPad,iPod compatible models. Cable length: 3Ft (approx. For iPhone 3G/3GS/4/4S/ iPad iPod Touch. Quantity: 2x Cables. Works with Apple USB Power Adapter for charging from a wall outlet. USB 2.0 for efficient syncing and charging. ). 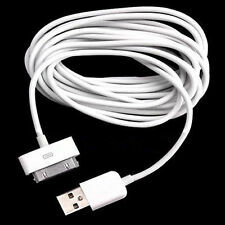 You're buying: 10Ft White USB Data Sync Charger Cable For iPhone 3G/3GS/4/4S iPad iPod Touch. USB 2.0 Data Sync & Charger Cable for iPhone 3G/3GS/4/4S iPad 2 iPod Touch. Cable length: 10Ft (approx. Color: White. 9.5 into New as photos. Special for iPad 2 2nd Gen（9.5 into New）. ~~~~~~images ~~~~~~.